After studying my BE Aeronautical Engineering degree at St Peter’s University in Chennai, India, I joined Hindustan Aeronautics Limited for a month and then GKN Aerospace India in 2014 as an intern, then a graduate engineer, before being promoted to stress engineer. I spent two and a half years working at GKN Aerospace. I always had a thought to pursue a master’s degree in Aerospace. I had visited the UK thrice as a graduate engineer and as a Stress Engineer, all times to the GKN site in Bristol and Isle of Wight. Some of my colleagues there had been to Cranfield and told me a little about it. I also searched online for the top universities in the UK for aerospace and narrowed it down to Imperial College London, Bristol and Cranfield. 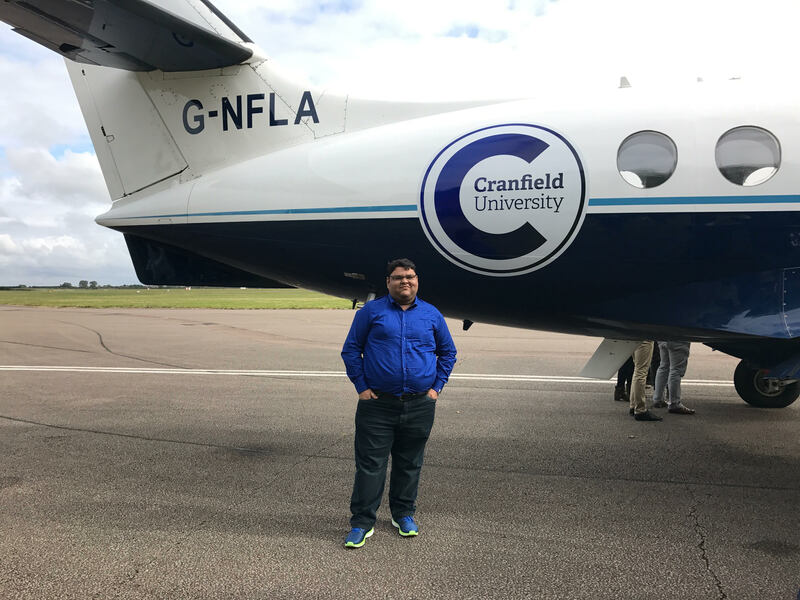 In the end, the group design project and the course modules at Cranfield were the clincher, and I also preferred the way in which I was able to take aircraft design as an option of the Aerospace Vehicle Design (AVD) MSc. The application for the course was quite simple but I found the visa process quite complicated. I am very grateful to Stephanie Watkins in the student immigration team at Cranfield who I spoke several times on Skype, as well as loads of long email conversations! She really helped me as there was an issue with my required documents, and even spoke to the British High Commission on my behalf. When Stephanie went on leave, she made sure her colleague Mohammed looked after me and kept everything moving along so that I could get my visa. The whole process took around three months but I think this can be shorter if your situation is more straightforward. During this time I also applied for the Chevening and Commonwealth Scholarship and got through to the final rounds. Like most of us, one of the things that had prevented me from enrolling on to a postgraduate course was the funding. I had actually applied for master’s courses twice before but deferred. This time though, I was determined to come to Cranfield. So I was really disappointed not to get the scholarship, but I found another way to fund my course, with help from my parents. My advice is not to give up if you run into a problem, you may be able to find another way! My Technical Manager, General Manager and HR Manager at GKN Aerospace were very supportive and offered me a leave while I complete my master’s. As I said earlier, several of my colleagues knew Cranfield and some have even done the same course (i.e. AVD), so I asked them for their opinions before making the final plan to come here. They all encouraged me to go for it. I felt it was the right time for me to pursue a masters. So, on 28th September 2016 I landed at Heathrow Airport. I had booked the airport pickup service through the university, and it was reassuring that there were some other new students also getting picked up which meant I had people to talk to on the journey! I was most nervous about the weather, and the food – I’m a vegetarian and I was concerned about being able to find the food I wanted to eat! But I’m glad to say that there are several options in Milton Keynes and I have been able to find all the Indian snacks I could want. I live in an en-suite room in Lanchester Hall in a Ground Floor Flat, which six of us share – two Nigerians, two Britons, a Chinese student, and me! We share the kitchen (and the housekeeping staff has told us we’re one of the tidiest flats and we have also been appreciated by the Student Switch-Off Team!) and we take it in turns to cook our best dishes for the others. So when it’s my turn, my flatmates have chance to sample some vegetarian specialities! The first few days on campus were pretty difficult, I felt a bit low, as I was away from my family, but once I got myself a map and started to find my way around and meet new people, I felt better. There’s a Student and Academic Support team who are there to help us, and Laura Hargreaves (who looks after Aerospace Vehicle Design students like me) is really nice and always replies very fast if you email her with a question. The first three months has been really good, but hard work. The library is open 24 hours – and you’ll soon understand why! Before Christmas our task was to complete the first part of our group design project, so the lectures are all designed to support us in doing that. The teaching here is different, there is more incorporation of real-life examples and industry experience. 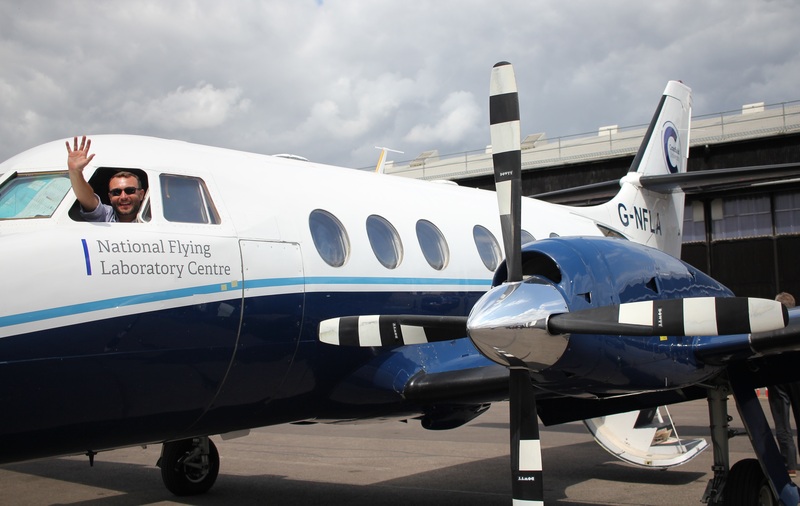 For example, we were shown aircraft models, technical videos and real aircraft components to demonstrate the theory that we were learning, which was really helpful. After a few weeks of getting to know each other we were put into the groups for our group design project. There’s a real range of people on the course, from those in their early twenties who have come straight from undergraduate study, or those on the Erasmus scheme, to people in their fifties who have many years of experience in industry (mostly working in the defence sector). We have people from Spain, France, England, New Zealand, Australia, Bangladesh and India in my group with a great mix of different strengths. One of the key things we did early as a group was to identify and nominate a leader, who organises us and distribute tasks based on our different experiences. Since we have to work so intensively together, I was worried we might argue or disagree on things but so far we have been very good at listening to each other and communicating our different ideas on the technical solutions to the problems. Apart from the teaching faculty we have a good support from a post-doctoral researcher Dr Juan . He also did the Aerospace Vehicle Design MSc course at Cranfield so he knows the challenges of the group design project and is a great person to have guiding us. The Group Design Project is appealing to me because it is challenging, innovative, it combines people from all over the world and I think it helps us to meet and understand lots of the requirements of the aircraft design industry. When I’m not working on my master’s I have been involved in some activities including the Airbus ‘Fly Your Ideas’ competition, the Cranfield Aeronautical Society, the Student Switch-Off group and the Bedfordshire regional committee of the Institution of Mechanical Engineers. It’s a great way to meet people and make new contacts in the industry. I have also recently enjoyed a flight in the Bulldog aircraft, taking off from the airport on campus! I am looking forward to the second flight soon! My advice to new students thinking of coming to Cranfield, or anyone thinking of postgraduate study, is don’t just blindly believe what other people tell you. Compare course modules at different institutions and make sure you pick the course that best suits you. Also, don’t feel that you can never get admission – it can be hard but if you keep going, and ask for help along the way, everything is possible! Vijay is from India and a current MSc in Aerospace Vehicle Design (Aircraft Design option) student in our School of Aerospace, Transport Systems and Manufacturing. 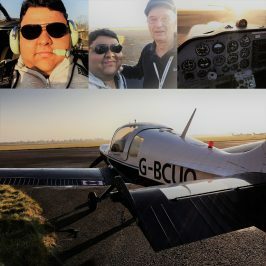 He works as a student ambassador for the university, and is part of the Cranfield Aeronautical Society, the Student Switch-Off group and the Bedfordshire regional committee of the Institution of Mechanical Engineers. Hi Odusina Oluwasegun ! Many Thanks for your kind words. All the best with your undergraduate studies ! There are some students from Nigeria as well in AVD. Myself Jay Bharat Desai, I am an Indian. Recently I submitted the online application to Cranfield University of UK for the program of Masters in Aerospace Vehicle Design – Aircraft Design. My undergraduate background is Electrical and Electronics Engineering (EEE). Therefore I am willing to take Pre-Masters Course so as to compensate the lack of Undergraduate that is Mechanical/Aerospace Engineering, this would make my masters degree of two years. Actually I wanted to pursue Bachelor in Aerospace Engineering but unfortunately could not. 1. How good is this program in terms of academic content? 2. What is scope of getting a good job after I receive this masters degree? Please reply because you have first hand experience of this program. In addition to it, I sincerely request you to provide me your UK mobile number and mail id. Therefore looking forward to hear from you. I am a graduate jn BE aeronautical. I am planning for UK and specially Cranfield.I need advice on selection of course. I am a bit confused over it. It would be great if you helped me out. This is Sajeed Shaik, I need a advise on selecting course . A bit confused either to select aerospace manufacturing or aerospace vehicle designing . which have good job opportunities?. And in English requirements they have mentioned seven tests (like IELTS,TOEFL),my question is all the seven tests need to qualify or qualifying in any one test is enough. Give me reply as soon as possible Bro.